Obesity is increasing in an epidemic manner in most countries and constitutes a public health problem by enhancing the risk for diseases such as diabetes, fatty liver disease and atherosclerosis. Together these diseases form a cluster referred to as the metabolic syndrome. Owing to the increase in obesity, life expectancy may start to decrease in developed countries for the first time in recent history. Despite the importance of the fat mass very little is known about the maintenance of fat cells (adipocytes) in humans, how different fat depots are regulated and how, or if, this is altered in obesity. My research group uses recently developed strategies, such as radiocarbon dating and retrospective lineage tracing, to investigate the origin and turnover of adipocytes, their progenitor cells and lipid stores in lean and obese individuals. Basic physiological functions of adipocytes in lean and obese individuals are also investigated. Understanding adipocyte heterogeneity and the dynamics of adipocyte turnover, may shed new light on potential treatments for obesity. Originally from Perth, Australia, Dr Spalding received her PhD from the University of Western Australia’s School of Anatomy and Human Biology, in the field of Neuroscience. In 2002 Dr Spalding moved to Stockholm, Sweden as an Ambassadorial Academic Scholar. This was followed by a postdoctoral fellowship in the neural stem cell laboratory of Professor Jonas Frisen, at the Department of Cell and Molecular Biology at the Karolinska Institute . 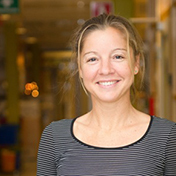 Dr Spalding is currently an Assistant Professor of CMB at KI. Her primary research field is regenerative medicine, with a focus on cell turnover in human fat and brain tissue.